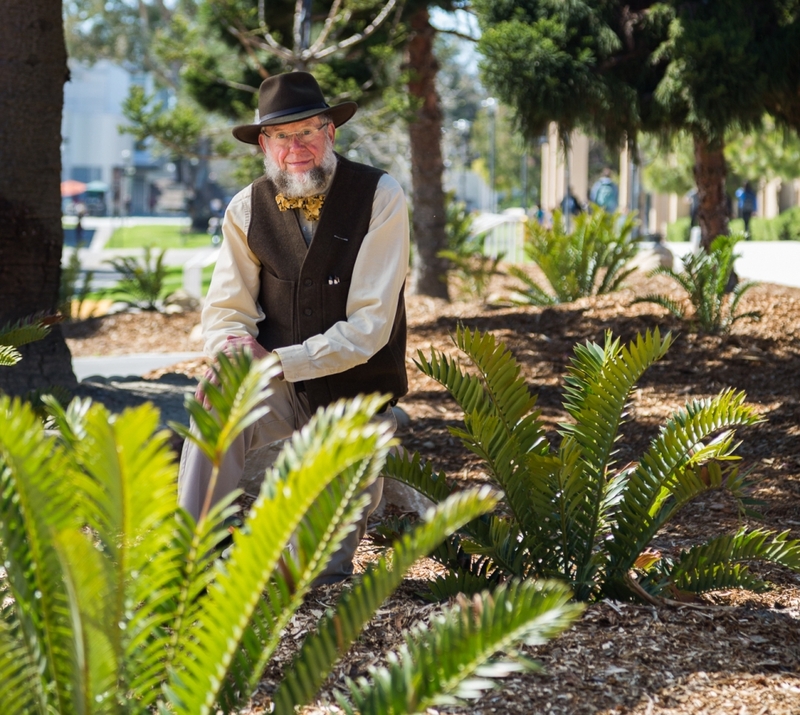 Bruce Tiffney amongst the cycads and Auracaria along Pardall corridor on campus. Bruce Tiffney is among several UCSB faculty members who use cycads, a Dinosaur-age plant, as teaching tools. Nothing like cruising campus on your bike and catching sight of a dinosaur. Of course, if it’s not a triceratops in your peripherals but a Jurassic plant, you may zip right on by, oblivious to the ancient wonders rooted on the grounds of a modern university. Behold UC Santa Barbara’s new installation of cycads, the plants considered “living fossils” that do, in fact, date to dinosaur times. An assemblage of the archaic greenery now adorns a bustling part of campus known as the Pardall corridor. Planted among some existing Araucaria trees — distinctive evergreens that in their own right can be traced to the early Mesozoic age — they are a throwback to our prehistoric past. Tiffney, an evolutionary biologist who specializes in plants and their fossil record, is among the UCSB faculty members who use cycads as a teaching tool (there is a smaller grouping of these plants outside Webb Hall). As part of a course on dinosaurs, for example, students are asked to visit both the cycads and the Araucaria for a glimpse of what their environment might have been like. Beyond their instructional value and their Jurassic flavor, the cycads also bring a big dose of sustainability to the campus that always has environmental efforts in mind. The plants replaced a large swath of grass, now covered in mulch, resulting in water savings (cycads don’t need much) and reduced emissions (mowing not required). With mowing and edging no longer needed, green waste on that part of campus also has decreased. The project brought other positive impacts, too, like labor once spent on lawn care being redirected to other needs. But perhaps more significant, according to Calderon: the design, construction and installation of the cycad garden all was completed by campus staff. That feeling extends to local area resident Ron Garber, who donated the retro flora in question. 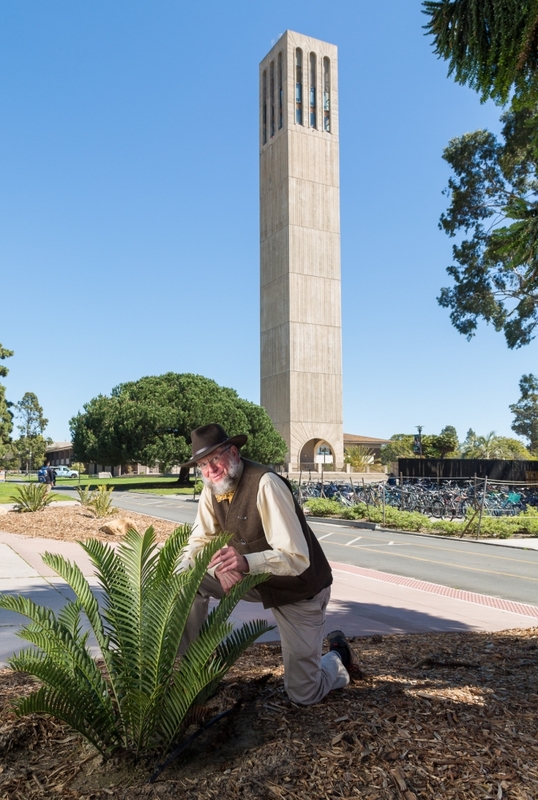 A cycad aficionado and longtime collector, he hybridized two African species of the plant as an experiment — and gifted them to UCSB on something of a lark. “I decided that since I ride my bike through campus and go right by this area every Sunday, and sometimes also during the week, I could enjoy them planted there, not have to water them, not have to tend to their pruning and care — and lots of other people could enjoy them too,” Garber said. “It was a win, win situation”.